We all know that Exfoliation or getting rid of the dead skin cells is an essential part of a good skin care regime. When done in the right way it can certainly do wonders for your skin. However, we must follow certain important tips while exfoliating so as to achieve maximum benefit out of it without harming the skin in any way. Even an expensive high end brand exfoliator/scrub may not work for you if you fail to use it in the right way. So, in my article today I would be sharing a few common mistakes which we should avoid while exfoliating the skin. 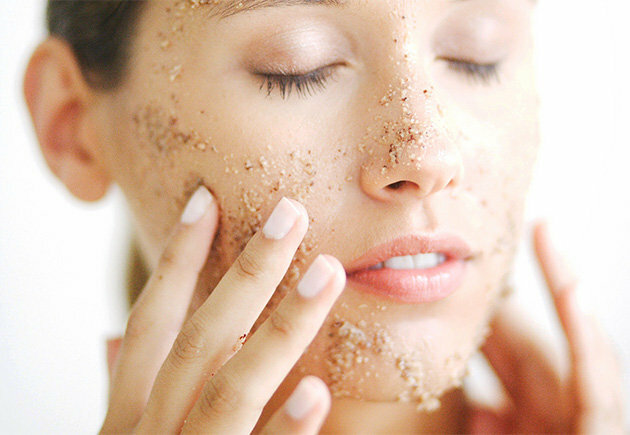 When it comes to exfoliating your facial skin the golden rule is to opt for a mild scrub with lightly abrasive particles. A scrub that feels gentle is always a good choice for facial skin. However, you may use a strong scrub with hard particles for your body but not certainly for your facial skin. It is important to exfoliate your skin only when it is clean and free from any sort of dirt, grime, grease or makeup. Exfoliating unclean skin can block your pores instead of clearing them out. Also, dirt and grime on the skin can hinder the exfoliator/scrub from doing its job completely. So you have a whole lot of scrub tubes and you want to empty them quickly? But never go overboard with scrubbing your skin. It is not a good idea to scrub/exfoliate on a daily basis. Limit this to 1 or 2 times in a week if you have been scrubbing your skin way too often. Always be very gentle when you are exfoliating your skin (especially the facial skin). Take your scrub on fingertips and lightly massage in circular motions. Do not scrub any area for more than 15-20 seconds. Using strong strokes to scrub away those dead skin cells can damage the skin instead of making it soft, supple and glowing. Always avoid exfoliating your skin when it is irritated or not in a good condition. It is not right to scrub your skin when it is not in its normal healthy state. Please allow your skin to restore and recover. Using a scrub over already vulnerable skin can increase the problem although more. Using a moisturizer once you have finished your scrubbing process is extremely essential. This step takes care of your freshly cleaned pores. Also sometimes, a scrub may leave your skin dry, stretchy an uncomfortable. So, always follow with any moisturizer that suits your skin type after exfoliation. Image Source : 1, 2, 3 , 4. Same here rati…even I dint knew that one should not scrub dirty or unclean skin…wil take care of that here onwards nupur…thanks for these useful tips.. The third point.. Does that mean that I should first use a face wash or cleansing milk and then scrub? ?